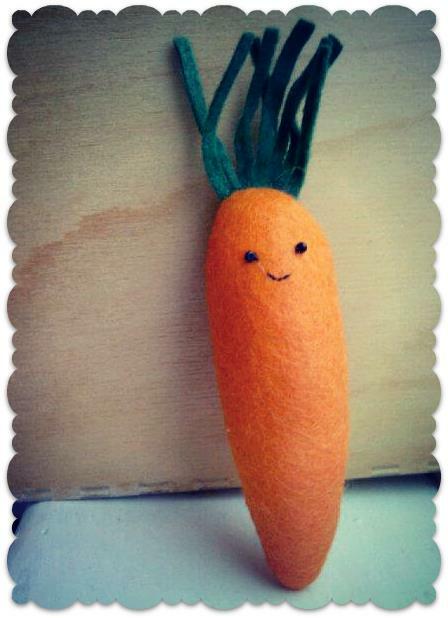 ME ♥ Hi! 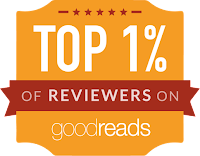 It is great to be interviewing you! I would love to know more about you and the brand. 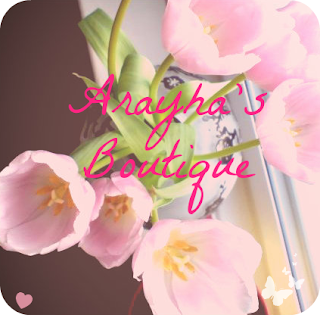 So first things first: what is Arayha's Boutique all about? 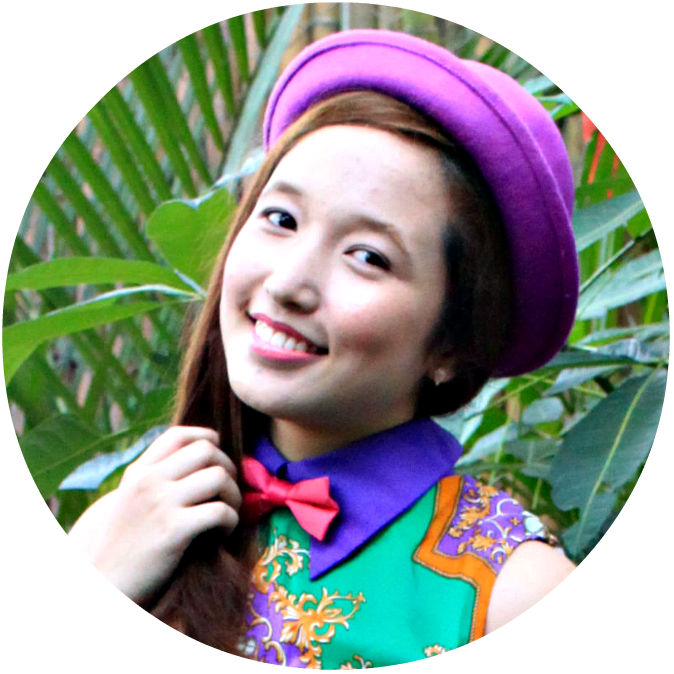 SARAH ♥ Hi and thank you for choosing to interview me. 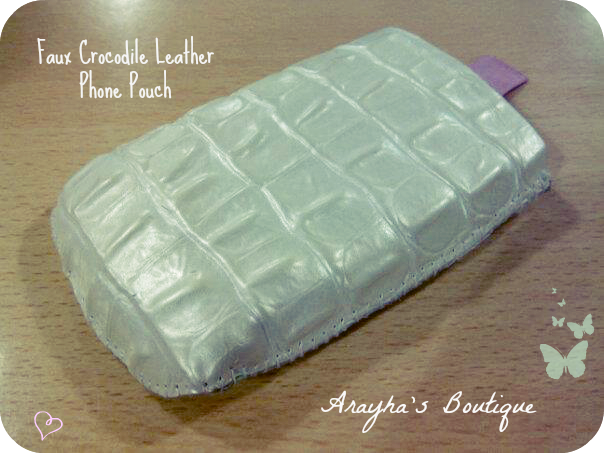 Arayha's Boutique sells bespoke handmade clothing and accessories. 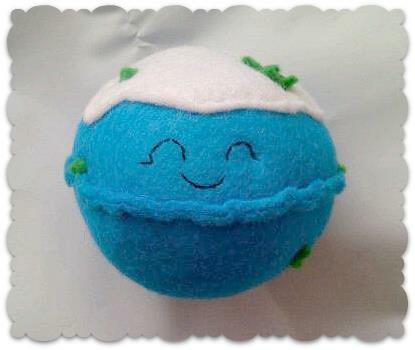 It was founded in the summer of 2012 as an outlet for my arts and crafts and also as a place to sell Lushie Plushies. Lushie Plushies are cute plush figures based on the products of the UK bathing and cosmetics company Lush LTD, originally made for the fans of Lush but now I make them for everyone, under licence of course. 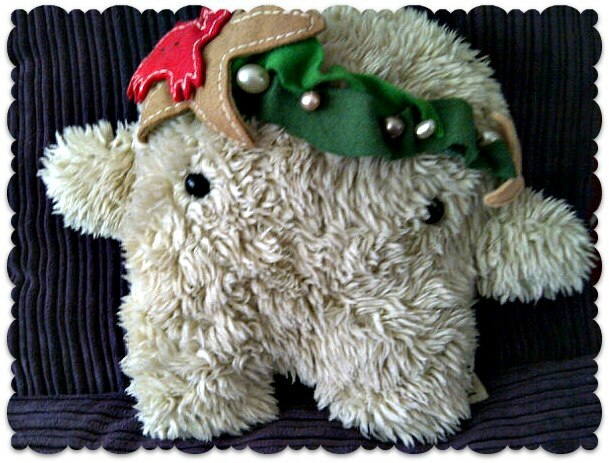 SARAH ♥ Arayha's Boutique aims to provide its customers with beautiful handmade items that they will cherish and love. SARAH ♥ I've always loved being creative. It runs through my veins and I often daydreamed of having a job where I could make and sell my own creations. 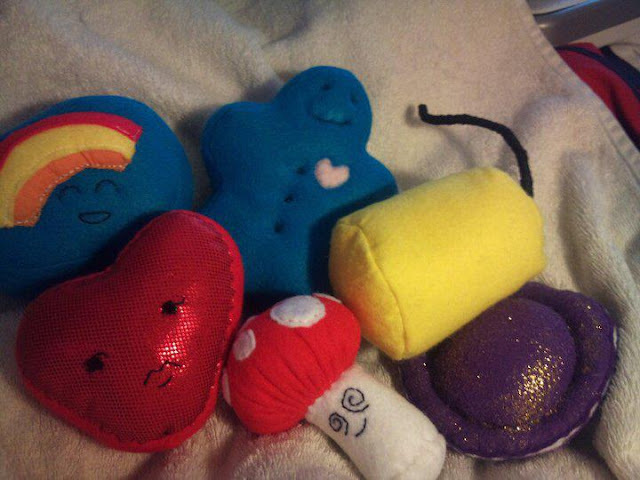 A few years ago, I started making cute plush figures to swap on a forum and a few friends and family suggested that I should sell them. So my inspirations are those closest to me, who believed in me. 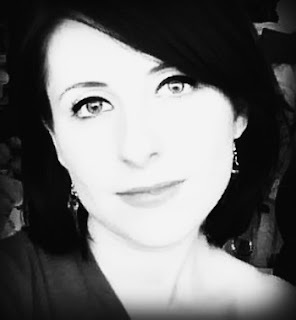 SARAH ♥ I run Arayha's Boutique around another part time job so my daily routine varies depending on my free time. An ideal day would start with finding my inspiration for a new piece; this could be from a dream or a color or shape I see. I usually like to go outside and see if anything catches my eye, then I sketch my ideas. 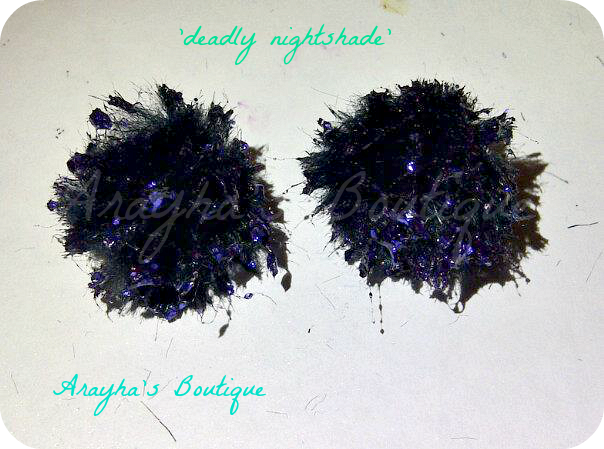 Later, I would make a test version or sample and photograph it to seek opinions on my Facebook page. If the results were positive or if I absolutely loved the idea, I would then make the item, photograph it and post it online to sell. SARAH ♥ My work environment is absolute a chaos! As they say, a creative mind is a messy mind. Well, it's definitely true of my studio areas at home! I make items in two places at home; my bedroom is where I sketch ideas from dreams and hand sew or make smaller items and everything else I make where my sewing machine lives, in a small corner in the from room of my tiny English flat. My walls are plastered with quotations and notes. My shelves house my trinket boxes and found objects and my ceiling is covered in fairy lights. I like mess, but pretty and creative mess. ME ♥ I love the the fairy lights! Out of curiosity, what is the story behind the name of your shop? SARAH ♥ Arayha is a female fairy character I created many years ago on holiday at the seaside. I say created, but the name more or less screamed out to me in a dream and I had to write it down. It's pronounced A-RAY-A, the H is silent. Back then, I searched all over the internet for the name came up with nothing. It was like a new name being created. Of course, I then used it for all my user names on forums and it seemed only natural (as I was known as Arayha when I made the Lushie Plushies) that I named my boutique with the same name. If you searched Arayha online now, you will find all sorts of people with the same name. SARAH ♥ To be honest, I don't really care for current trends and fashions. I like what I like and I make items I'd love to own myself. I am struck by inspiration from the most unlikely places and objects and I run with that inspiration to create my pieces. My favorite inspirational influences have to be seasides, the color turquoise, the precious gemstone amethyst, my dreams or daydreaming, sparkly glittery objects, natural features, feathers, seashells, stones, light airy fabrics, the stars and wanderlust. I could be anywhere and something will catch my eye and almost glow at me so I can't look away, that's when I know I have found my inspiration. SARAH ♥ I have a few lines coming out this year. My first is a spring line called Spring Showers that is inspired by a typical British spring. The weather is usually wet and misty, almost magical and I'm currently creating some beautiful pieces of rain for you to wear. Another line I'm excited about is my summer range called Wanderlust which is inspired by traveling, found objects and faded summer colors. The other lines are a surprise! ME ♥ We can't wait to see those collections. Do you have an actual shop that people can visit? If yes, where is it located? If not, do you plan on having one? SARAH ♥ As I just started out, I don't have a shop but I do have a Facebook page, a blog, an Etsy page and a Twitter account you can follow and see my creations on. I aim to participate in upcoming craft fairs in the UK and in the future I would love to own my own shop. SARAH ♥ My personal style is defined in one word: comfy. I like to feel comfortable in my clothes. I usually opt for flats, leggings and loose draped tops with 3/4 sleeves and a large handbag. I don't wear a lot of jewelry. I prefer simple stud earrings and delicate bracelets or necklaces (most of the time I will wear only studs but occasionally I will wear outrageous earrings). I would describe my style as only suitable for the summer season, but I will wear it all year round anyway and add a chunky knit cardigan, gloves, scarves and a hat to try to keep warm. I refuse to wear socks unless I'm wearing rain boots or going to work. SARAH ♥ My must-have style staples have to be a large neutral bag that goes with anything, comfy shoes that make a statement (I have spiked flats), Lip balm (Lush LTD's Whip Stick is my favorite, and a piece of treasured jewelry or an accessory that makes you happy and keeps you inspired. I don't currently have it but I will be making myself a real Amethyst accessory to wear. At the moment, I carry an opal angel figurine that has been blessed with holy water in a velvet bag inside my handbag. It makes me feel protected and it's also pretty to look at when I need to feel uplifted. SARAH ♥ I'm not really obsessed with any current trends but I do love the work of the late Alexander McQueen especially his shoes. He was so creative and always stood out. ME ♥ What are the bestsellers of Arayha's Boutique? 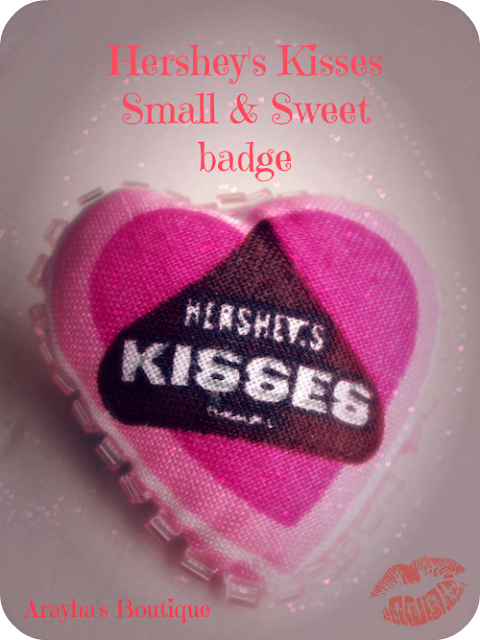 SARAH ♥ Our current best sellers are our Lushie Plushie figures, our cushion based on those figures, our faux fur studded earrings which look beautiful against sheer floaty fabrics, our faux crocodile skin pearl phone case which adds a stylish touch to your accessories and our new valentine Hershey's Kisses badges which look really cute pinned on lapels, in your hair and onto wristbands. Our upcoming ranges will be featuring headbands, t-shirts and other draped tops, necklaces, bracelets, scarves and dresses. 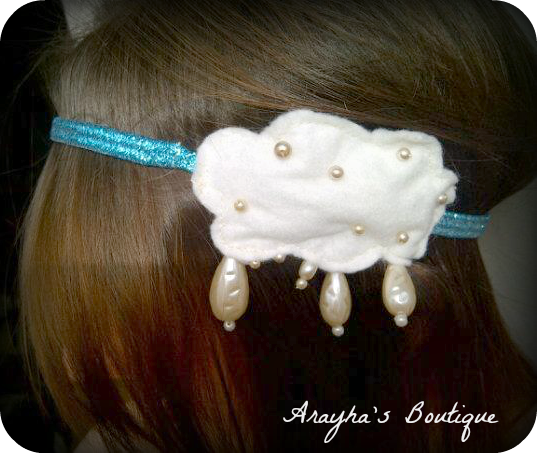 Two items from our ranges are already on our Etsy page, a rain cloud headband which would look cute worn with a blue dress and crystal encrusted shoes and also a pearl covered ruched beanie that would look cozy with soft knits and a chunky scarf. SARAH ♥ What's in my bag? Everything! I have my Blackberry with it's stunning 'Amethyst Angel' phone cover that I co-designed with my friend Delighted Angel (https://www.facebook.com/delightedangel), my Lush LTD Whip Stick lip balm--a gorgeous nourishing chocolate delight--A huge Ollie & Nic purse, house keys, business cards, tissues, hygienic hand cleansing gel, hand cream, pens & scraps of paper to jot ideas down, gum, mints, hair ties & grips, my opal angel and whatever found objects I happen to come across that day--usually pretty stones or abandoned buttons. Oh and a bottle of Vimto. SARAH ♥ I don't read much these days and if I do it's usually craft books, I'm currently learning to knit. As a child I couldn't get enough of fairy tales--Aesop's Fables, The Famous Five, The Secret Seven and various choose your own adventure books. SARAH ♥ I'm listening to Labyrinth's Express Yourself a lot lately. It always puts me in a good mood if I'm feeling doubtful. I also love old summer songs like Mungo Jerry's In The Summertime. More modern music I like listening to includes FUN, Daft Punk and Eliza Doolittle.